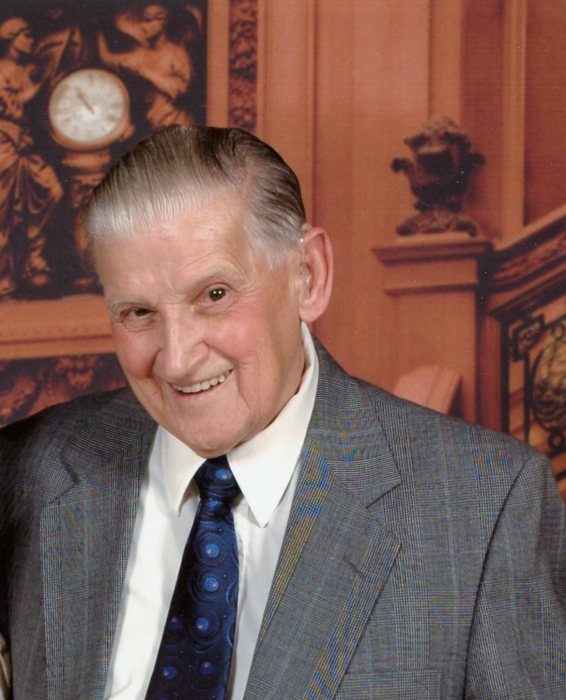 Obituary for John L. ("JACK") Lee | Frank Kapr Funeral Home, Inc.
John L. “Jack” Lee, Sr. 95 of Scottdale, formerly of Bellevue, passed away peacefully on Thursday afternoon, November 29, 2018 in Excela Health Frick Hospital, Mt. Pleasant in the loving presence of his Son. He was born August 10, 1923 in Oakland section of Pittsburgh, the son of the late John A and Mary C. Mahoney Lee. Jack was a member of the Church of the Assumption of Bellevue and attended at St. Pius X R. C. Church, Mt. Pleasant. Jack was a graduate of Duquesne University with a degree in business. His entire career was spent in the advertising field working for Kaufmann’s Department Store for 25 years, Papercraft Corp for 10 years, and the Pittsburgh Catholic Newspaper for 33 years. Jack enjoyed travelling with his family especially on cruise ships and other destinations around the world. He was a Proud WW 2 Army Veteran serving with the 495th Air Squadron. He served in Rome-Arno Northern France, Rhineland Central Europe. He was the recipient of the Good Conduct Medal, America Campaign Medal, European African Middle Eastern Campaign with 4 Bronze Stars and the WWII Victory Medal while attaining the rank of PFC. James R. Lee of Leesburg, Fla.
Jack’s son cordially invites family and friends to the Frank Kapr Funeral Home, Inc. 417 Pittsburgh St. Scottdale, Sunday from 1 – 4 PM & 6 – 8 PM. Prayers of Transfer will be held in the Funeral Home, Monday at 9:15AM with his Funeral Mass to follow at 10AM in St. Pius X R.C. Church, Mt. Pleasant with Rev. Richard Kosisko, as Celebrant. Interment will follow on TUESDAY at 1:30 PM in the National Cemetery of the Alleghenies, Bridgeville, Pa.
Full Military Honors will be accorded at the Funeral Home, Sunday evening at 6:00 PM by the Southmoreland Veterans Association Honor Guard. A Parish Wake Service will be held in the Funeral Home, Sunday at 3PM. Funeral Home doors will be locked between hours.